Let me start this by saying this is my first blog post while nestled at home. The awesomeness of it all is indescribable. Meanwhile, when I received the invitation to a Mad Men themed New Years Eve party, I didn't exactly know what to expect having never having seen the show. 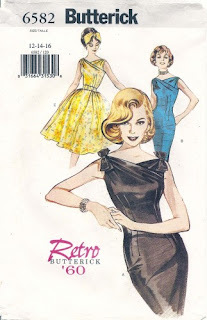 I did know, however, that it would be the perfect opportunity to break out vintage pattern Butterick 6582. This classy little frock has the necessary mix of New Years Eve festivity and early 1960s class. Armed with a few yards of amazing emerald taffeta, my dress form, and a slew of pins, I began a whirlwind twenty-four hour dress making extravaganza. It must be said that when one scores excellent bargains like patterns for $1, sacrifices like proper size must be made to obtain the styles you want after other pattern pickers have left the drawers barren. 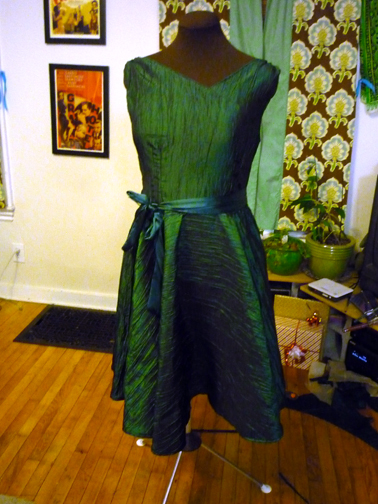 I had to go up two sizes from the pattern, and I couldn't have done it without the genorous gift of my dress form. Thank you, thank you, thank you. I was absolutely blown away by your gift. I was just about to attempt making my own dress form when I was presented with yours. I think you have forever changed my sewing life! An hour before the party, I was trimming threads and applying fake eyelashes. I'm pleased with how it turned out, and it was truly the perfect party dress (the twirling definitely gets an A). I'm particularly fond of the neckline. There's something about it that is both feminine and sophisticated. While it's higher, I didn't feel matronly. I will keep this pattern on call for the other silhouetted versions of the dress. It appears to be flattering on everyone from what I can tell in other photos around the web. What a great looking group! Can you believe those rich colors? Mother Paquette says, " I'm glad you can use the dress form and very happy that it has found a new home with such a creative person. 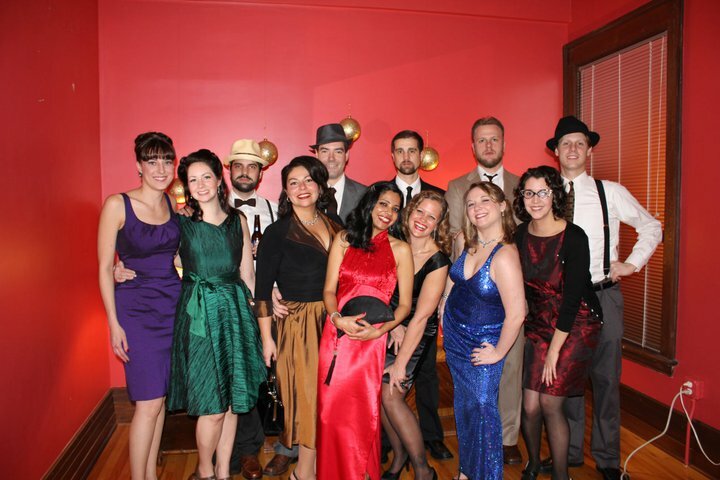 The dress you made for NYE is very beautiful considering you had to go up two sizes! !